Today was an excellent day for riding, and we took full advantage of it. Well-rested, we were up shortly before 6am, and on the road by 8 – beating our previous “record” by almost two hours. The terrain was mostly flat, and we had a tailwind, so were moving along well. When we stopped for a snack, a couple on a tandem pulled up shortly afterward. 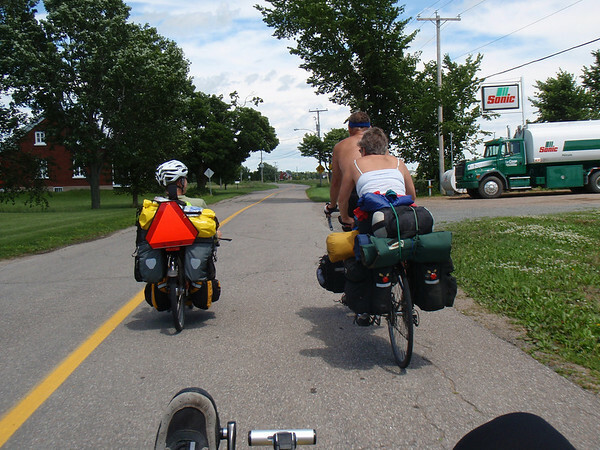 They were Bob and Linda up from Iowa for a two-week tour around the Route Verte between Montreal and Quebec City. They were only going a bit faster than we were, so we joined them, and spent the rest of the day chatting and laughing. Linda is the Executive Director for a Habitat for Humanity affiliate in Iowa, and Bob is active in bicycle advocacy and has written a guide on bicycle touring in Iowa, so they had lots of stories. I hope when we’re in our 60s we’re as active as they are! 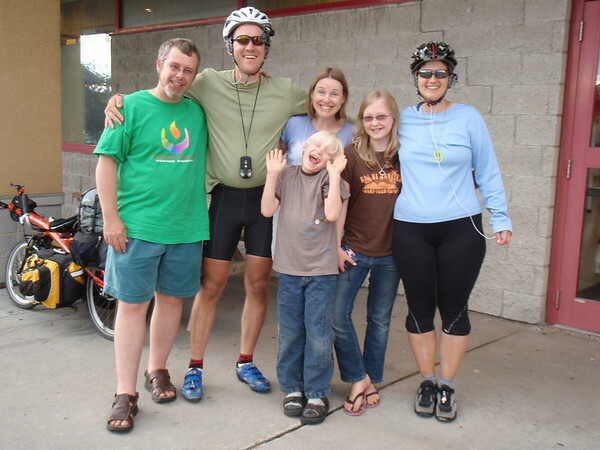 They are doing more mileage per day than we are, and manage to carry about half as much – perhaps something we can learn from… Their daughter Jess is a Unitarian-Universalist minister’s wife in New Mexico, which is a neat connection too. Just after we finished shopping for dinner at the IGA in Trois Rivieres we had the shock of our lives. A VW van, plastered with stickers and towing a big trailer pulled up beside us, and a woman was hanging out the passenger window shrieking! After we got over our shock, we realized it was the Flatt family, friends from New Brunswick. Sharon recognized our bikes, and was screaming in surprise and shock. They had just pulled off Highway 40 to get gas and fill up their water jug so a few minutes earlier or later and we would have missed them. We weren’t expecting to see them until we got to Fredericton in September!